This is one of the biggest local cruise-ins, regularly having over 100 cars from all over. The parking lot is well lit, there's plenty of food nearby, and everyone has a good time. This year, the torch passes once again to a new organizer, Carl of the Scoops, Stripes, and Spoilers Car Club. And I'm pretty sure the tradition of this event will continue as it has in the past. And as in the past, there will not be an event in August in order to allow everyone to go to Priceville's annual show. What a great night. The weather was great, the food was plenty, and awebb of Red Baron Photography was out covering the event. He even brought his lighting setup to work on creating special shots with Steak and Shake in the background. The next time you see him out, feel free to ask him about shooting anything special on your vehicle or creating a special shot. On my way over, I saw a gixxer in traffic, so I got a couple of shots of him. Apparently, he was posing too. I grabbed a few video clips of some of the unique vehicles that drove through--including the largest wheels on the highest Impala I've ever seen. A great night to end a busy day. We'll see everyone again soon! I see you took some pics of the blue/white Challenger. That's a great customer from Sound on Wheels that had a NICE audio system installed! Also, that black C6 Z06 looks AWESOME! Thanks to everyone who came out this month! We had a great turnout. I estimate around 80-100 cars showed up. 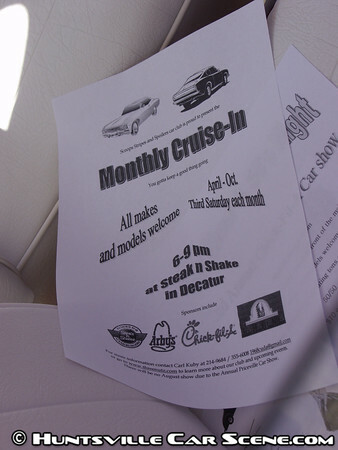 We had a great time looking at cars, eating good food and spending time with new and old friends. We hope to see all of you out there in May, on the 15th! I may have to get one of those personal professional photos this month, they look awsome!